REVIEW: Terms and Conditions was a publisher proof copy in a pile of publisher proof copies beside my bed. I had been told that everyone at Bloomsbury Australia loved the book – which is only right since they were taking the trouble to publish it. They think it could be one of those surprise hits. They are going to back it with marketing. My first thought on hearing this pitch is, try Googling the title. But I like the mob at Bloomsbury and take it home. I put it with the others. I try not to think of this ever growing pile of proof copies as a burden. I try to think of it as a lucky dip. I imagine myself a child again plunging my hand into a tub filled with wrapped presents. I’m hoping for a water pistol, but instead find a pair of socks. Good socks, school socks, a pair that would do the job well and would last, but socks all the same. I try again. I want a packet of throw downs, I get a compass. I know I shouldn’t grumble, the prizes I have won have their uses, they are practical and necessary. Good solid dependable things. By the time I pulled out Terms and Conditions I was expecting a pair of Y-Fronts. 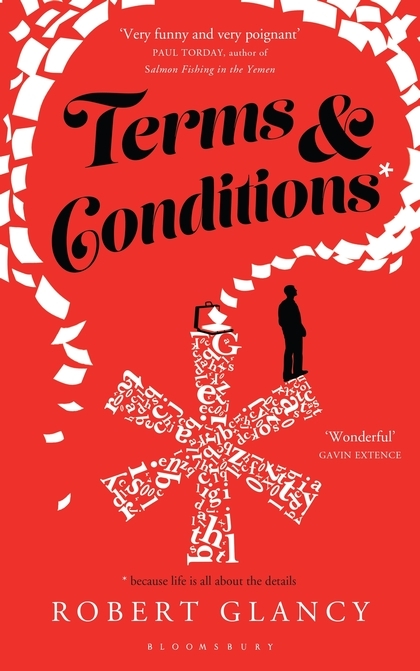 In the first chapter of Terms and Conditions the narrator, Frank, wakes in hospital, there has been an accident. He has amnesia. (God it is difficult to refrain from following this statement up with – he doesn’t remember a thing.) Thus we meet the two most important people in Frank’s life at the same time he does. His wife, Alice (Alice is my wife – allegedly) and his brother, Oscar. Frank works for Oscar at Shaw&Sons the law firm their grandfather founded. Note: In one of the finest ever uses of a footnote in the history of literature Frank reveals his true opinion of his brother. It made me snort. Author Robert Glancy sets up his dark comedy over the next few chapters as Frank, a stranger to himself, tries to come to terms with the conditions of his life. It is easier than he thinks. He writes contracts for Oscar. He is married to Alice. He is very dull. But then his memory starts to return and this is where the novel takes off. But is Terms and Conditions a very useful pair of Y-Fronts or is it something more exciting? Comic timing rests upon structure. And this novel has been cleverly thought out. On every page there are enjoyable jabs aimed at the inanities of modern life. But it is the arrangement and delivery of the details of Frank’s life which increase the comic possibilities. Thankfully Glancy never overburdens his story with his direction. His characterisation saves him. Although the depiction of Frank’s wife Alice and her descent into corporate culture is so close to the truth I fear that those with no experience of corporate life may think the depiction fantastical. Glancy delivers on the promise of the first half of the book, keeping a firm grip on his narrative right to the final lines. But is this the work of a talented artist or a competent craftsman? I think the answer lies in the relationship between Frank and his other brother, Malcolm, who has rejected a partnership in the family law firm and now lives a carefree life traveling the world. Malcolm emails Frank throughout the novel offering Frank (and us) an alternative perspective on life. Terms and Conditions is a very funny book. At once a cautionary tale, a love story, a comedy of manners and a self-help book like no other. You will want to read it a second time. The fact that it is so funny doesn't mean that it is lightweight. There is great meaning here, too. I put my hand into that lucky dip, my bedside pile of proofs, and was rewarded not with a pair of Y-Fronts but with a slingshot, the weapon of choice for those wanting to bring down something big.